Back in the 1970’s, we did not know just how deeply the Corvette was woven into America’s car culture, as its allure had not yet hit its stride. It would be a decade or more before we understood how entrenched the passion for the Corvette was. At that time, we drove them purely for the joy of a hot ride and as an extension of our own personality. Working on a hunch backed by intuition has been my calling card since those early days. Whether it was an entire collection or a 1958 retractable hardtop, I learned to follow my instinct. There were plenty of wild goose chases but every once in a while a tall-tale became truth hidden under a tarp in an out of the way garage. Long hours, hundreds of miles and years melted away when the jewel was unearthed. When opportunity knocks, it is important to open the door. 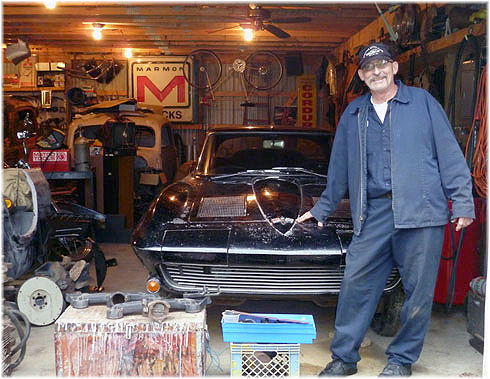 What keeps us motivated to bird dog these barn find cars? It is the thrill of the chase never forgetting the importance of doing your homework. It is what we in the hobby continually wrestle with; frustration versus pay-off. We understand the real value of “The Find” comes only after the forensics and research validate the hunch. Only then can the conversation about restoration versus preservation take place. Only then can we consider historical importance as opposed to watching these cars run the course in freshly restored brilliance. ... And finally, ask anyone who has chased a storied car and they’ll tell you that these “barn finds’” real worth lie in the people who found them first. These owners’ lives are forever interwoven in the cars’ history and like the cars themselves; they are priceless barn finds as well.